This page is a good reminder for the Java EE6 developper that plan to use Eclipse indigo with weblogic 12c or greater for developping Servlets/JSPs/EJB/JMS applications. Notice the presence in the bin dir of a directory named "sample". This is an example database. By default, the derby server locates databases in the bin dir. In Eclipse, in the Java EE perspective, locate a tab called "Data Source Explorer", right click on "Database Connections" and choose "New" in order to add a new connection. Then you must indicate which JDBC driver you are going to use. 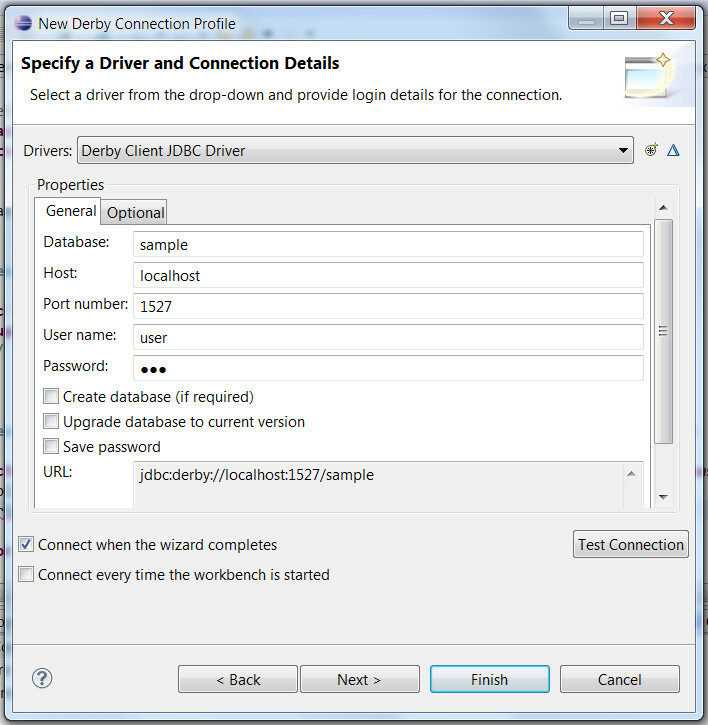 Choose "Derby Client JDBC driver 10.1", but this is not enough, you need to set the proper jar file to use. So click on the small rounded button at the right '"new driver definition", then on the "jar list" tab. Remove proposed jar and click on the "add jar/zip" button on the right. Go to <java db install dir>/lib and select the derbyclient.jar file. Enter the sample database infos: sample/localhost/1527/app/app (app is both the value for user and for password). Unselect the "create database" button. Click on the "test connection" button on the right. In WebLogic 12c, run the admin server from the windows start menu, then open the weblogic admin console (also from start menu). Next dialog : enter a name for the database : I suggest "SerbySample", enter a JNDI name for accessing the database from a java EE application. I suggest "sample". Choose "Derby" as the database type. CLick next. Next dialog, check the AdminServer as a target for this database. Do not forget to select the target server otherwise your datasource will not be exposed to external applications. We will proceed exactly like we did for javaDB, the only thing that changes is the way we will launch the MySQL server and the name of the JDBC driver. 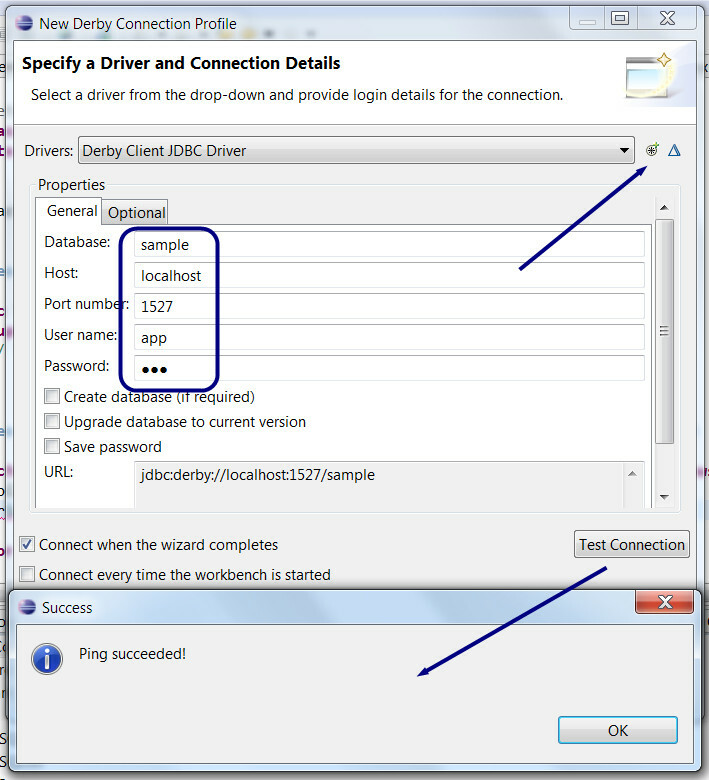 The MySQL JDBC driver is already installed in WebLogic but not in Eclipse, in order to be able to add a datasource to the Data sources tab in the Java EE perspective of Eclipse, you will have to proceed like we did for JavaDB, see the previous section. You will have to remove the proposed jar file and add the one from step 3. 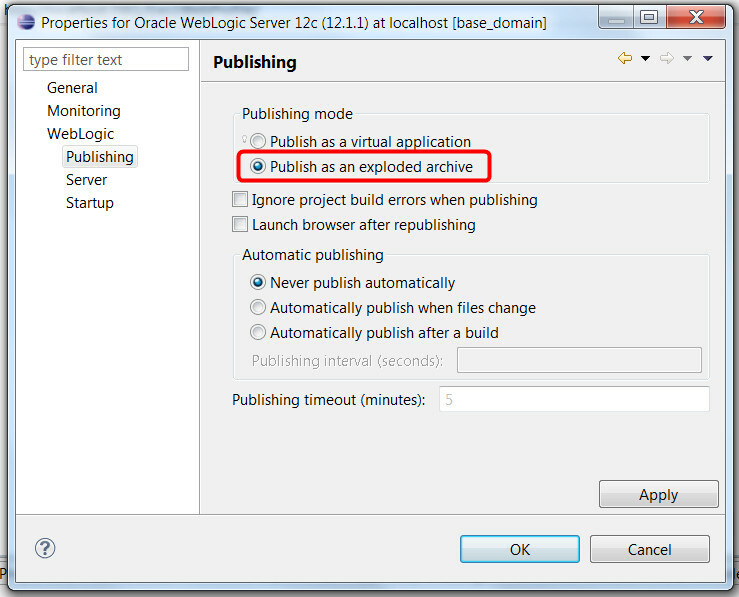 There is a bug in weblogic 12c when working with "web profile" projects and JPA. You can't deploy war files otherwise there will be errors in the persistence unit that is not correctly taken into account. A fix recommended by Oracle consists in setting up the deployment option for the weblogic server to "deploy exploded archives". Add wlfullclient.jar, a jar with all the client libs you need. This jar needs to be built once, using a command line interface cd in the WEBLOGIC_INSTALL_LIB/server/lib, then run the command "java -jar wljarbuilder.jar". This will take 30s to build the client lib for your installation. At the end, you should find a wlfullclient.jar file. Add it to your build path. Note: Message Driven Beans are not supported by the JavaEE 6 "Web profile" (all in one projects with jsf/jsp/servlets/ejb/jpa in one single project, deployed as a single war file). For MDB you need to create an EAR project, and an EJB project (maybe with JPA facet), and maybe a Dynamic Web project (for jsf/jsp/servlets). The MDB should be added into the EJB project. The client servlet we demonstrate here should be added in the dynamic web project. Normally the Eclipse wizard should ask you for the names of the connexion factory + destination. Here is an example of a MDB that works with the client from the next section. Check that the name used in the MDB is the same as the JNDI name you can find in the JNDI tree for your weblogic server. You can do that by looking at the weblogic admin console, on the left, click on "base_domain", then "servers", then in the main page click on the name of your server, then in the main window you should have something like "JNDI tree"... Click on that, a new tab opens in which you can explore the names objects on your server. In the small tree, click on "weblogic" then "jms" then on the connection factory and destination. You will find in the detailed view the JNDI names. propertyName = "destinationType", propertyValue = "javax.jms.Queue"
Here is an example of a servlet that sends messages to the previous message driven bean. In fact it doesn't know the actual receiver of the message, it just knows the destination where the message is being sent. Again, double check the names of the connection factory and of the destination. They should exactly match the ones in the weblogic admin console and the ones in the MDB.